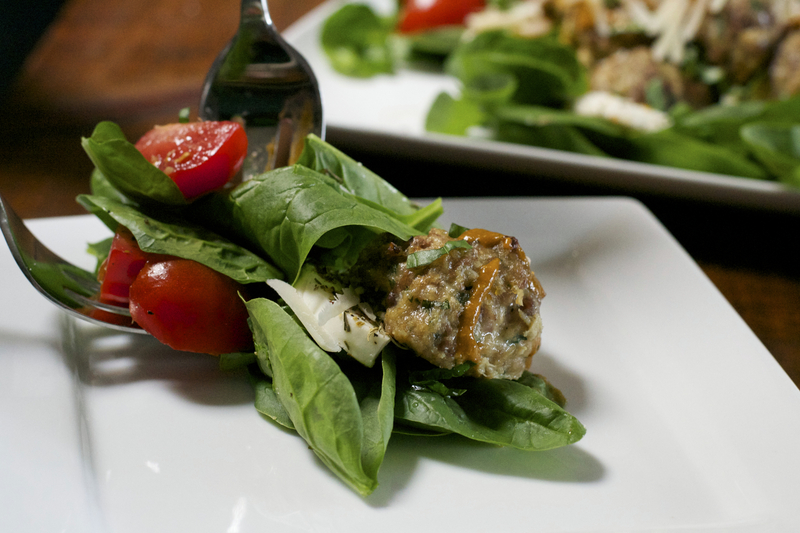 Italian Meatball Salad-What the "Forks" for Dinner? We all wished for warmer weather and our wish has come true! So, with warmer weather, and our garden doing very well, it was time to make salad! 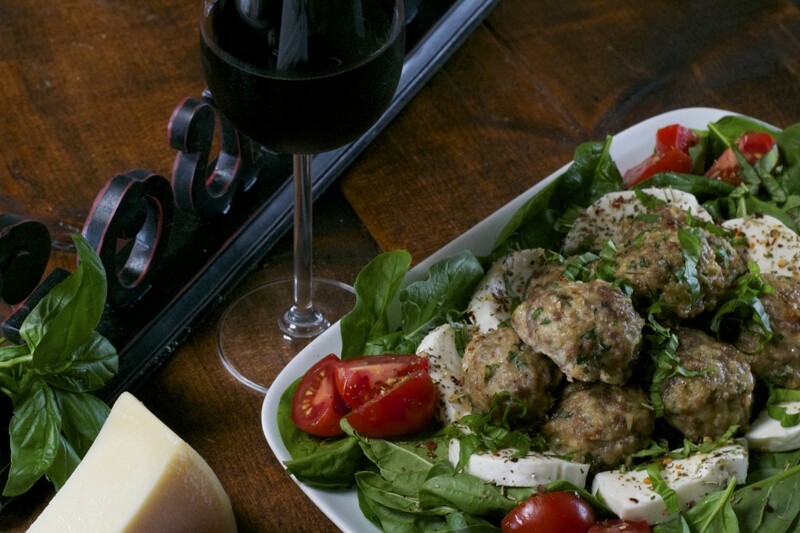 Italian Meatball Salad! Our lettuce and spinach has done very well this year. Especially the baby spinach, which is the base for this salad. You can use whatever kind of lettuce you like, but due to our over abundance, I chose baby spinach. The weather this week has been warm and sticky. I really didn’t want to heat up the kitchen or even cook for that matter. But, we had to eat, so I trudged on. I had some leftover meatballs from another meal in the freezer so, out they came…….but what to have with them? 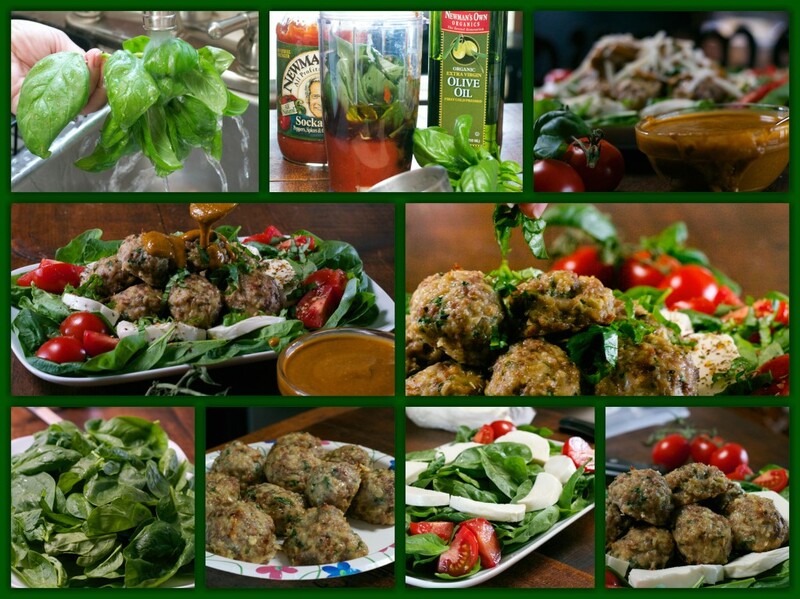 Since they were Italian spinach meatballs……spinach theme……Italian theme? Tomatoes, mozzarella cheese, and basil. But what for a dressing? I wanted to keep with the Italianese, and meatballs need marinara….hmmm. I made a basic vinaigrette and added some jarred marinara sauce. A little parmesan cheese and the result………….FANTASTIC! Tim and I both thought it was the perfect dressing for the Italian Meatball Salad……like spaghetti and meatballs……with no spaghetti…..
Now, above all it was easy. Used left overs, I didn’t need to use any thing but the microwave (I heated the meatballs just a bit). It was inexpensive (using my own produce), and best of all it was totally yummy!! 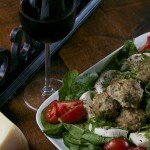 So, now that the heat of summer has arrived try this Italian Meatballs Salad for a cool summer meal! Place spinach on serving platter. 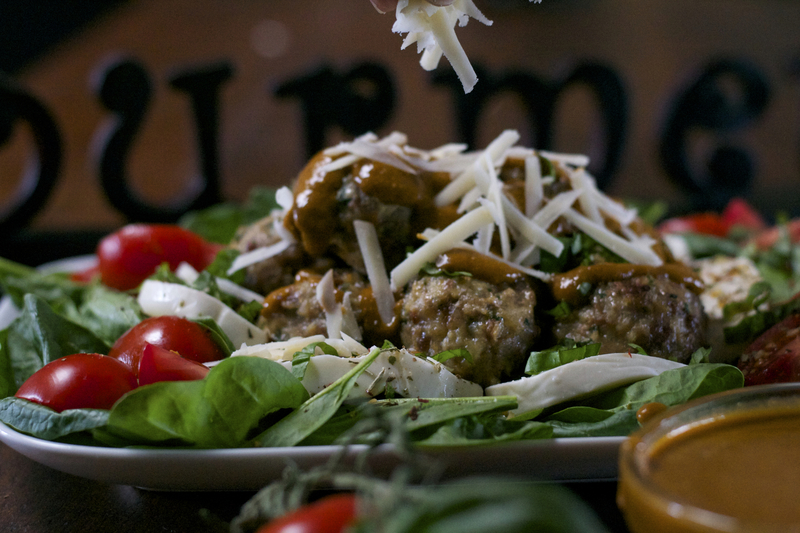 Arrange mozzarella,tomatoes, and meatballs on spinach. I used meatballs I had left over from another recipe, but you can buy frozen prepared meatballs.Heat to take the chill off. Grind (or sprinkle if you are not using a grinder) the Italian seasoning over the top of the entire salad. Garnish with parmesan cheese and basil. Serve with Marinara Vinaigrette. In a blender,small food processor, or a Bullet Blender combine Marinara, basil, parmesan cheese, vinegars, mustard and garlic. Pulse with 1/2 cup of olive oil until blended. Add remaining olive oil and blend until emulsified. Season with salt and pepper to taste. Serve at room temperature. Refrigerate to store.